Update: A Microsoft spokesperson sent us a statement saying a network issue was the cause of the problem for the New England Patriots and not the tablets themselves. "Our team on the field has confirmed the issue was not related to the tablets themselves but rather an issue with the network," a spokesperson said. "We worked with our partners who manage the network to ensure the issue was resolved quickly." The problem lasted for about 20 minutes, but all is now well (unless you are the Patriots, who lost the game). The NFL also issued a statement about the incident on Monday: "Near the end of the first quarter, we experienced an infrastructure issue on the Patriots sideline that impacted still photos for the coaching tablets," said spokesperson Brian McCarthy. "The issue was identified as a network cable malfunction and was resolved during the second quarter. The issue was not caused by the tablets or the software that runs on the tablets. We have experienced no issues with the tablets this season. Any issues were network related." Surface may be the "official tablet of the NFL," but a one-sided problem during the AFC Championship game Sunday between the Denver Broncos and New England Patriots isn't the kind of awareness Microsoft is trying to build by outfitting teams with its slates. "On the Patriots' sideline here, they're having some trouble with their Microsoft Surface tablets," reported Evan Washburn of CBS early in the second quarter. "That last defensive possession, the Patriots' coaches did not have access to those tablets to show the pictures to the players. The NFL officials have been working at it. Some of those tablets are back in use, but not all of them. A lot of frustration that they didn't have them that last possession." "That last possession" resulted in a Broncos score. It wasn't immediately known what the specific issue affecting the tablets was. Denver, which is hosting the game, reportedly didn't have problems with its Surface tablets. Another sideline reporter spoke with the NFL which said it didn't need to shut down the Broncos' tablets as only New England was having problems, and it was after kickoff. The same reporter also talked to a Microsoft Surface representative who said that the Patriots are using hard wires to "keep [the tablets] going." Twitter erupted with reaction, some even dubbing the situation "Tabletgate." 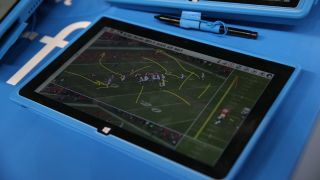 Microsoft paid the NFL $400 million to put Surfaces into every facet of the game, though it's not uncommon to hear TV analysts and others refer to the tablets as "iPads." If it's any solace to Microsoft, that probably won't happen again after today.